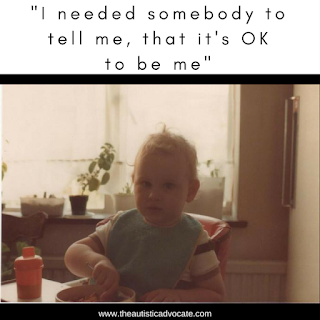 Autistic people have a voice. I've struggled massively with writing this. If you saw someone going through Autistic Burnout would you be able to recognise it? Would you even know what it means? Would you know what it meant for yourself if you are an Autistic person? The sad truth is that so many Autistic people, children and adults, go through this with zero comprehension of what is happening to them and with zero support from their friends and families. If you're a parent reading this, I can confidently say that I bet that no Professional, from diagnosis, through any support services you're lucky enough to have been given, will have mentioned Autistic Burnout or explained what it is. If you're an Autistic person, nobody will have told you about it either, unless you've engaged with the Autistic community. It was just a chat, their little boy was struggling in school and and they were looking for some advice in how to deal with the school. Somehow we got onto talking about my experiences at school and onto my suicide attempt at fourteen, which I describe in graphic detail in How to hide your Autism and An Autistic Education. My story was horrifying enough to them I imagine, but I think what horrified them most, was what had led me to that point in the first place. They'd never heard of Autistic Burnout. When I described to them what it was, they actually recognised a recent episode where it had occurred with their son and the more they looked back at his life, the more they started to recognise the pattern; they started to see how life for an Autistic person is really a series of peaks and troughs. They now see how frequently he has been through it and how they've pushed him to keep going through it, unwittingly, when he had no way of communicating what was happening to him. So, what is Autistic Burnout? Firstly, you may have heard of something called Autistic regression. Autistic regression, which in itself is a horrible name and a terrible descriptor, is often described around the time a child is diagnosed, or as the reason to seek diagnosis. A parent may describe the child as losing some or all of their verbal communication ability, for any person of any age they may appear more 'typically Autistic'. As a child, milestones they had passed - walking, toileting, verbally communicating, may revert back to a pre-milestone position. The name Autistic Regression is completely wrong though, as what it does not take into account that it can be and is often temporary, it is part of the ebb and flow of Autistic life, caused by the impact of society and the environment the person lives in, it is NOT a permanent return to a former or less developed state, as many would have you believe. There are, in my opinion two distinct types of Autistic Burnout that feed into each other. The first is often termed Social Burnout. This is a frequent occurrence, where just your day, just living, talking to people, being assaulted by senses, exhausts you to the point where you can only collapse in a heap at the end of the day, or at the end of the week, depending on your constitution (remember this won't be identical for everyone, but it certainly will be similar). This happens at any age, from a baby up until old age. The bell rings for the end of the school day, the children are filing out of school, so I duck out into the woods and light a cigarette. I need the noise muted and filtered; the wind does that, carrying the hubbub of the end of day away from me - I'm an expert at this by now, staying downwind of noise. My whole body is tired, lead boots weighing me down, my brain slowed distinctly, reactions are slack. Surrounded by noise; screaming children in the playground, shouting children, singing children, musical instruments, banging and clashing, the general commotion of the classroom; and over the top, the dumpf - dumpf - dumpf of my heart in my ears and in my chest. The strip lights overhead, flickering constantly in pulsing waves, each one shooting through my eyes and down through my body; I can physically feel each pulse humming and vibrating. A vast array of colours and patterns on the brightly coloured walls, covered with brightly coloured work. The sun glaring through forty year old, grimy windows, diffracted around the room, while a billion dust particles dance captivatingly, confusing my already overwhelmed eyes. And over the top of it? Suppressing my reaction to all of this, the urge to scream and scream and scream till I explode - wanting it all to go away. My face is still, good eye contact made, no matter how much it hurts, being touched constantly, leaving my skin feeling like it has been repeatedly pressed by a molten hot branding iron. It's not over yet though. Three quarters of an hour of tidying and prep for the next day and it's time to leave. I get a lift with a colleague as the buses are so infrequent, so I have to maintain conversation. My colleague is lovely though and can generally sense somehow when I can't speak, a ten minute car journey often passes in a vaguely comfortable silence. It's sometimes like a tiny piece of decompression time before i get home. When I get home there's nobody there. Sometimes turning the key in the lock is the hardest thing to do, it's so heavy. The weight of the bag on my back pulling down. My lead boots heavier and heavier. I get through the door and drop my bag. I crawl and stumble up the stairs and make it to the bedroom, collapsing on the bed without even the energy to remove my shoes, my eyes are heavy, exhaustion pulling my lids shut. Several hours later when Michelle comes home, she finds me and wakes me, I have enough energy to make it through the evening, just. My conversation is muted though, like when someone asks a child what they did at school and they reply with "Nothing". I want to respond, I want to engage, but I have neither the ability or the energy. I'm 26 and I've been doing this for as long as I can remember, practically every day the same. 3 years diagnosed and I have no idea what is going on, this is my normal. Can you imagine this, day in and day out - this is just everyday life and this was pre-me having children. I've got three children now and they are the light of my life, but how they have impacted on me having the ability to recover day after day is immense. I could no longer collapse - I didn't have the capacity. The responsibility of having one, then two, then three children led me to have to Mask and suppress even more, fight through and resist the extreme, overwhelming shutdown my brain and body wanted to go into. Autistic Burnout is exactly that; The shutting down of mind and body. If you've ever had a problem with a computer and it's had to go into safe mode - that would describe what happens to the brain - it runs on limited function, not all services are available - it's access to the Internet (my Rolodex, as I described in The inside of Autism: The world inside my head) denied and unable to connect. No little white bars to indicate how strong or weak the signal is, because it's just not there. Physically I often imagine it as the need for hibernation, where the body effectively stops all but the most important functions, the heart rate slowed, breathing distributed evenly and slowly, hovering on the precipice between sleep and death. Except, through this all, you are awake and expected to function, expected to get on and live your life, so you repeatedly go back and do the same things over and over again, put yourself through the exact same scenarios that caused you to feel like this in the first place, rinse and repeat. Another aspect of this is that Autistic people, for some reason, possibly related to Masking and wanting to fit in, are incredibly eager to please. Part of that eagerness, especially for those who don't fully fill the Pathological Demand Avoidance profile, is often an inability to say "No" to people. So we take more and more on, we allow our plates to get fuller and fuller, our anxiety heightens, our sensory processing becomes more difficult to maintain, our Executive Functioning abilities spin out of control and again this attributes to burnout. We aren't generally terrific at juggling plates. Jeanette Purkis, who is an Australian Autistic, an absolutely wonderful writer and a Member of my network organisation, The Autistic Cooperative, has written an excellent piece called "‘Too Nice’: Avoiding the traps of exploitation and manipulation." "There is an actual concrete reason that we tend to be taken advantage of and it starts with the difference in communication between autistic people and neurotypical people. Autistic communication is generally on one level. We are honest, up front and do not often do things like manipulation and deceit. We generally do not lie although many autistic people are capable of lying if they feel the need but usually it doesn’t come naturally. Neurotypical people (or ‘allistics’ if you prefer) operate differently in how they communicate. Their communication tends to happen on more than one level... It can be seen as the difference between visible light and infrared light. If you can only see visible light then it is hard to imagine what infrared looks like, even if you are aware it exists." These differences are not visible to an unaware or undiagnosed Autistic person, so it leads not only to the full plate, but offers up the Autistic person to all levels of potential abuse and manipulation through compliance. I could talk right now about Behavioural Therapies such as Applied Behavioural Analysis (ABA) or Positive Support (PBS) and how they take advantage of the Autistic being eager to please and open to manipulation, but I'll save that for another day. I mentioned in An Autistic Education, about the fallacy of parents repeatedly sending their children into school, making the same mistake over and over again, watching their child crumble before their eyes, yet unable to break the cycle even though they can see what is happening to them. You HAVE to go to work, as much as you HAVE to go to school. And all because we're made to think that we have to. As I mentioned earlier - burnout covers all age groups. Autistic babies suffer Social Burnout as much as children or adults. Babies who do not wish to be touched, babies who are forced into eye contact, babies who are picked up and manhandled, babies who have even less of a filter than Autistic children or adults, to block out the overwhelming sensory sensations they are put through. So, if this is the every day normal for an Autistic person, to one degree or another, from birth to death, what happens after an extended period of doing this? The second type of Autistic Burnout. You crash and you keep crashing. If you imagine everything that I have described above, the shutting down of mind and body, but imagine it occurring over a period of weeks, or months or even sometimes years. This is extreme Autistic Burnout. It's usually the result of the day to day overwhelm combined with an event or trauma, or typically the weight of life building to a point where the Autistic person has to cease to function. When I was fourteen, my Autistic Burnout was triggered by a combination of things. I'd reached the end of my tether with school - i just couldn't hack it any more, couldn't hold in the pain it was causing me any more, I was in a constant state of sensory overwhelm, I was isolated, confused and didn't know what was happening. My Grandfather had recently died too - which was a massively life-changing event for me. I've mentioned that touch burns me? Well at that point, the only person on the planet that I knew about, that could touch me without it hurting, was him. Albert Ferguson was the kindest cuddliest man i have ever known, I remember my eldest sister (who is also Autistic) and I were forever clambering over him, rubbing his shiny bald head, breathing in the smell of his tobacco and 'two fingers' of single malt whiskey. I'd lay there silent in his lap for hours while he'd regale me with regimental details, battalion names and numbers from his time in Burma during World War II and days later he'd test me on them, delighted when I remembered them correctly. When he died he left a huge gaping cavity in my heart and my mind. One of the worst parts was that he was hospitalised for a long time before he died, months and I was not allowed to see him. I was desperately sad that he'd gone, but I also incredibly aware that now I had nobody to touch or be touched by. I resigned myself to a life of pain at that point, could not conceive that I would ever find anyone else that wouldn't physically hurt me. So this combination, along with the overwhelming confusion of what was 'wrong' with me, why I couldn't really connect with anyone, why people singled me out or played tricks or used me, of what the hell was wrong with me and why i just kept hitting this wall over and over again, was what led me to crash and burn out - my physical body and mind started shutting down. I could feel each system in my body closing off as gravity got heavier than it had ever been. I didn't know what to do - did not understand what was happening to me - I had no way to communicate this. It was like a switch had gone off, my verbal ability to convey what was going on in my mind and body was gone. I did not want to die, I've never wanted to die. I needed to step out. I needed to remove myself from the environment and take myself elsewhere; I needed to escape. But the only way I knew how to do that was to die. So I tried. What I was feeling though was not depression, I know that now. The lack of distinction between Autistic Burnout and Depression; In fact the lack of recognition of Autistic Burnout at all, outside of the Autistic Community, has caused many problems for Autistic people. Many who have been identified as depressed have been and still are being put in psychiatric units, psychiatric care, drugged and then have developed Mental Health issues off of the back of this - when really what they needed was major sensory withdrawal/stimulation (depending on the person), acceptance, understanding and rest. I'd been taken multiple times to the GP by my Mum and had been from the age of twelve on various types of antidepressants, which looking back, is actually quite horrific, but probably indicative of a time where so little publicly and medically was known about mental health, let alone Autism. I cannot emphasise enough how important it is to make the distinction: that Autistic Burnout is a separate thing from Depression and how important it is, that it starts being recognised and addressed in Society. None of this is meant to imply that an Autistic person cannot be depressed - that is not the case at all. Along with the things that cause anybody to be depressed, prolonged burnout can definitely lead to a depressive state, as indeed can, as the study above shows, a lack of Acceptance -it is hard for that negativity to not be absorbed, especially by people who are emotional sponges and highly reflective of the emotional state of people around them. This is also definitely not to say that a suicide attempt comes along as part of the package of Autistic Burnout, because it doesn't always. I've had periods of intense burnout where i haven't taken that measure. It is however indecently common amongst teenage Autistics diagnosed or undiagnosed; and those who are diagnosed later in life. Recent studies show that prevalence of Suicide attempts amongst Autistic people stands at 35% of the population, with suicidal idealisation at 66%, with separate studies indicating that approximately 10% of all suicides are by Autistic people - bearing in mind we make up 1% of the population, supposedly. I would hazard that that rate is exponentially higher in reality. I'll talk a little more about suicidal idealisation later. Extreme burnout comes fairly regularly during an Autistic's life and there is a school of thought amongst the Autistic Community, that when Autism first becomes 'apparent' to parents - you know, the old "They were a perfectly normal toddler, then they had their MMR...", between the ages of 2-5, when it becomes noticeable to most parents who don't know what they are looking for and have zero frame of reference, that the child is undergoing Autistic Burnout - their apparent 'Autistic Regression' is because they have had some kind of event - starting nursery, going to school, home life changes, something sensory - it could be anything for each individual child, some major (to them) change that has overwhelmed them to the point that their Mask (which starts establishing itself very early on) has completely dropped off. The Mask coming off is exactly what happens during the Autistic Burnout period, your Autistic traits become more obvious as your brain goes into Safe Mode. You may become more inflexible, your ability to 'mock' making eye contact may disappear completely, your ability to socialise may be drastically reduced or go completely, you may sleep more, want to be on your own more and bury yourself. Life just gets significantly harder and gravity, as i mentioned before, just pulls you down more and more. Well, my job has left me. I was happy there once, for a long time. Then the rumbles of change started, people losing their jobs, major restructure. My performance dips, i grow tardy and try to cover it up. It's halfheartedly noticed and commented on, which just makes my anxiety worse, everyone really is too worried about their own jobs though. I spend day after day not doing anything, other than pretending to work, because I'm not coping. My life is spiralling out of control and all I can think about is the look of horror on my Wife's face when I tell her I'm jobless. The lack of communication, the vague realisation that the people you work with, the people who have actually helped make life feel sort of good over the last few years are my competition now. All of a sudden it seems like everyone is Autistic, nobody makes any eye contact with each other. My replacement, from elsewhere, sits opposite me, I'm to train him. I'm offered my job, but a long way away. It feels like the final slap in the face. They know I'm Autistic, they know I have Meniere's disease and can't go that far on the bus - what'll be a two hour journey every morning and night. I walk out. I ride the bus home. I go to bed. Then the click. The flick of the switch. I feel it deep inside me. I recognise it with abject horror, i remember the feeling. I remember the lack of self control. My mind goes into Safe Mode. What to do? How do I explain this to Michelle. I clutch at my throat and my words are gone. They come back a time later and I'm able to tell her. The horror I imagined was there. But also love, so much love in those deep brown eyes. I was safe in them. The only eyes I've ever been able to look at. Eyes i can distinguish the patterns in and lose myself in. I clutched her tight and the Mask dropped off. I heard it slide to the floor and crack in half. The next few months were like wading through treacle, physically, mentally and emotionally, but equally I was wound tight as a spring. My sensory sensitivity was incredibly heightened, I couldn't tolerate noises, smells, too fast movement, anything really. Doing the simplest of things exhausted me and still at that point i had no real understanding of what was happening to me. I was an Autistic man on anti-depressants for the umpteenth time of my life, completely not depressed, but not knowing how else to explain it. The truth is, I was relieved not to be at work- it gave me the opportunity to switch off which I needed desperately. Had it not happened I think I may have looked at the suicide option again, it negated the need to step out. As it was around 9 months later I started to wake up again - my mind and body felt more alert than it had in years. Michelle and I have talked extensively about that period and the period after and she sees the difference in me. She recognises that I Masked an awful lot with her from the moment we met, despite my attempts not to and doesn't see it as me lying to her, she understands that I was doing what I did to survive and often unconsciously. My period of burnout saw me unable to function really at all. I was kind of a vaguely absent father - there, but going through the motions, rather than actively engaging. We struggled financially, I started proceedings for constructive dismissal, but was so crushed and lethargic, and the proceedings were through a Council process which was massively bent in the Council's favour, so we gave up. I can honestly say that those months were tortuous. We came within a hairs-breadth of losing our home. I expected Michelle to ask me to leave and wouldn't have blamed her if i did. But somehow we came through it and I came out of it. I came out as someone desperate to know what had happened to me. The pieces were falling into place that there must be a better way than this, there must be reasons for this. So I turned on line and found Autistic people. I started talking and learning, realising that ideas and narratives that had been floating around in my head actually existed and names - things like Neurodiversity. I found the Autistic community. I stumbled into this world; metaphorically, my eyes shielded by my arm from the glare of Autistic gold shining back at me. I've not looked back since. I said earlier I wanted to talk more about Autism and Suicide. Sadly the two seem to go hand in hand. But not all suicide amongst Autistic people is directly attributal to Depression, because not all Autistic people are depressed, as I mentioned before. Earlier I touched upon my experience at fourteen and explained how it was less an attempt to end my life and more being backed into a corner and it being the only way to get away from the situation I found myself in. Anecdotally, I have talked to a significant number of Autistic people about this (a few hundred) and have found that their experiences matched my own - not only in the 'why' they had attempted suicide, but also in that, like me, they are pretty much constantly thinking about ways they can do it. The noise of the traffic is too great. The cars are screaming past, one of those motorbikes that sound like giant broken hairdryers is gunning it's engine unnecessarily. The sun is glaring down upon me, the warmth is nice but the light is too bright, too strong and I don't have my sunglasses. A throng of people are walking round, I'm like a rock in a river with the current parting round me, but I'm being buffeted and jostled, my body is burning. Somehow I'm forced to edge of the street, right to the curb. My head is spinning, eyes feel like they're vibrating in my skull, my teeth hurt, everything is building and rising. I look up the road and see a bus coming, no chance of it slowing. I step in front of it. The world falls silent, everything slows. The bus coming towards me in slow motion, blurred with movement, feet away, inches away, the look of realisation dawning on the driver's face as he sees me, contorting into fear and horror. A glance back over my shoulder at the oblivious people, heads down, intent on their journey, not noticing the person about to dissolve into peaceful oblivion. I close my eyes, my arms open wide, embracing the stillness about to come, a world of soothing dark, comforting silence. I'm back on the pavement, jostled and bustled, ears assaulted with noise as the bus speeds past me. I do this all the time and so do so many Autistic people. Stepping into traffic, jumping off of things, taking pills, all manner of things. It ebbs and flows, depending on what your are doing or where you are. These are not intrusive thoughts, as such. It's almost like they are deviations on a path, where in one world you make the choice to step out and in the other you don't, but you bear witness to both those paths at once, for just a few moments - the intensity of the situation allowing you to witness a shearing of worlds, of universes, where in one you die and in the other you carry on. We generally don't want to die. We want to step out. The world is an overwhelming place for us - it doesn't have to be, but the way it's set up with colours, noise and lights and people and expectations makes it so. We lose ourselves in repetitive behaviour, we Hyperfocus, we Stim, we become different characters or act as animals, we script conversations, we withdraw, we hide in worlds inside our heads, we close ourselves off, or equally sometimes explode outwards, we Mask - all in an effort to endure this world we live in, to survive, to find balance with ourselves internally and externally and also, to hide who we we are - to make Non-Autistic people accept us, because we don't find acceptance as ourselves. This is why we burn out. Can you see why it's often mistaken for Depression? Run through that list again and apply each of those thing to, firstly, a child. Say one in the region of 0-10 years. How would all of those symptoms present? You got it in one: Bad behaviour, defiance, lack of compliance, willful disobedience, withdrawal, self-harm, depression. Especially, if you consider that any child, across what is a huge age range, is likely unable to be able to express or communicate effectively, if at all, any of those things, or why they feel the way they do, or even how they feel the way they do, especially if they are Autistic. If you apply it to a teenager, who has a mess of hormones running through them, who is acutely aware of how much they stick out like a sore thumb, whose growing self-awareness, their very sense of self, is being fractured by a combination of everything they are going through in day to day life AND everything on that list; how does it present? Bad behaviour, defiance, lack of compliance, willful disobedience? Or the other way, they withdraw completely, they're described as Moody, as an extreme Teen, they lock themselves away and become more withdrawn, less social, less able to function. Through all that they are likely still able to communicate any of this. Now apply both those scenarios to someone who is undiagnosed. From the outside looking in, they are behaving 'badly', 'acting out', or they are depressive, or ANGRY, so they are drugged and Therapised, or treated to such delights as PBS or ABA to 'improve' their behaviour', or they're just left to get on with it and kill themselves, or get caught in a cycle of self harm, or get wrapped up in short bursts of highs to make them feel better, as in drugs or criminal behaviour, as they fight against themselves and how they are feeling, or all of those things. It sounds drastic doesn't it? Yet it's happening every day. Mostly because people do not know or understand 'why'. There are a myriad of reasons so many Autistic kids (diagnosed and undiagnosed) are in the young offenders system and then further on, Autistic adults in the Prison system. So what can we do to to ward off Autistic Burnout and what can we do to mitigate it once we're in it? Firstly acknowledging and accepting that it is a thing and you or your child will go through it - Social Burnout pretty frequently and Extreme Burnout at least a few times in you or their lives. On a basic level, allowing periods of withdrawal, or decompression time at the end of the day, or even throughout the day can make a big difference. Time where the child can effectively take time to process what has happened throughout the day, shut off external sensory stimulation and basically be inside their own head for a period of time. You may also find that this helps with the level of and freqency of Meltdowns that occur. Especially if you or your child Mask and do the coke bottle thing of bottling up everything all day and exploding at home. Adult or child you need to proper time to withdraw. So even at Social events or Social Situations having an escape plan ready is vitally important. A reason to leave either completely or temporarily, a quiet space or bolt-hole to enable whoever it is to just have some time away from people. It's really important to recognise also, that after significantly stimulating or potentially overwhelming events or periods, that the person may need a day or two off of work or school. This may not be realistic, but it is effective. Allowing this decompression time is incredibly important. It allows the Autistic brain and equally the senses, an adjustment period to reestablish whatever the person's brain or body considers normal parameters. If the person is of school age, then it will definitely depend on your relationship with the school and how frequently they need decompression days, but my philosophy is generally that my child's mental and physical health is more important than a day at school - if they need a decompression day, they take it. If I need to be fined, then so be it, but I'd love to see someone try. Work may be a little more difficult but, again, it depends on how good a relationship you have with them. If for some reason you can't take a day, then taking as much free time to yourself as you can, with as minimal mental and sensory stimulation as possible is the best you can do. It won't be enough forever though. Once you're in burnout, you need to learn to recognise and accept that you are. There isn't a huge amount you can do beyond throwing away that Mask as soon as possible and taking as much space as you can get with as minimal sensory input as possible. Some people find that doing hands on tasks helps them, others go for long walks, or immerse themselves in books and films. Sometimes it drags on and on, sometimes you can see it coming and not be able to stop it. The period I'm in now was triggered by me, if I'm totally honest. Autism Awareness week in the UK was, this year (2018), incredibly busy for me and so was the week preceding it. I established a working relationship with the North East Autism Society earlier in the year and they asked if my family could be their campaign - so hours of filming, I blogged everyday, I made videos for the first time, spoke on various radio stations, we featured across several newspapers five or six times over the course of the week, plus I also had a trip down to London for the launch of the Westminster Autism Commission report on harmful interventions, plus had to respond to the hundreds of Tweets, Facebook Comments, messages and emails that were thrown at me. All in all I threw myself into the whole week. If you've gotten this far down this article, you can probably imagine by now what I felt like after all that. I have written the majority of this article in one day, for the last six weeks since Autism Awareness Week, I've written nothing, not a word. As I said at the beginning, the irony being that I wanted this to be about burnout, yet didn't have the strength to write a thing. The biggest thing of all you can do to prevent, or at least mitigate burnout, is to start identifying what you do when you Mask and stop. Even just little things like eye contact, which so many of us do, or at least pretend to do. Allow yourself not to be sociable if you don't want to be. Give yourself permission to duck out of situations you can't cope with instead of pretending you can. Got something important to do? Cut out as much of the other crap as possible - give yourself a break, go hole up in a cupboard under a blanket for a few hours, or alternatively, if you are able, go and run or cycle really, really fast (sometimes the wind rush can literally help clear away the cobwebs because so much sensory information is cut out). A big sensory break every few days, or weeks, coupled with smaller sensory breaks throughout the day could make the world of difference to your life, or the life of your loved one. The biggest thing of all you can give yourself, or your loved one, is time. I've experienced Extreme Burnout probably 4 or 5 times in my life. Lesser ones a significant number more and social burnout pretty much daily. The biggest thing that has helped me avoid and mitigate it, is learning about myself and the way I have done that, is by connecting with the Autistic Community. Autistic people have the tendency to want to pull people together because of their similarities, not push them apart because of their differences - We are accused of wanting to be solitary, of not wanting to be around people, when we have one of the strongest Communities I have ever witnessed. The Autistic community is there waiting to be used by Autistic people and their families alike; a font of deep knowledge, a library of cross-referenced and correlated information about Autism, that you will not find coming from an Autism 'Expert' or 'Professional' and you will certainly not find in the DSM 5 or ICD 10/11. 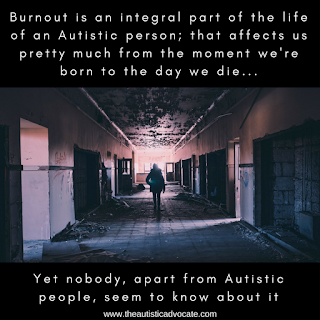 Autistic Burnout is one of those things you will not learn about from Professionals, yet Autistic Burnout leads to death. How horrifying is that? So please, play your part today and help yourself, or your Autistic loved one to recognise it and take appropriate steps to stop it. I'm coming out of my burnout period. I feel like mentally and physically the fog is lifting - I'm starting feel like gravity is slightly less effective as it has been, I'm still exhausted and have been sleeping sometimes 14 hours a night - which is bizarre for the person who has spent his whole life averaging 4-5 hours a night and actually has made me more tired than refreshed I think! I know it's coming to an end because I'm writing again. It's taken me six weeks of staring at a computer screen and writing nothing. Yesterday I wrote most of this in about three hours. I'm on an upward trajectory again and it feels good. Still not quite there though, my Executive dysfunction is still playing merry hell - I've been tinkering with this now for five days! Sometimes knowing what you are experiencing makes the experience less frightening and easier to manage, it offers you a level of control over the situation and expecting it will happen does too. If society changed to accommodate us our lives would be a lot easier, instead though, for the most part we are still expected to change ourselves completely or play catch up - so if there are ways where you can make your life easier - and not damage yourself in the process as with Masking, then i recommend you do them - there is no support for this, except from Autistic people, and if you're lucky enough to have understanding family - so self-care is your priority. A key thing to remember here, because there are, I know, proponents of a theory that much of what is identified as Autism is actually the descriptor to a response to lifelong trauma and I know that much of what I write here could be seen to be backing up that theory. As a disclaimer. It could not be further from the truth. Trauma plays a huge part in the the Autistic upbringing and life, but that feeds into Anxiety. Autism is described by Neurology. Our Neurological functions are different from birth, our brains work differently. Trauma does not play a part in shaping our Neurology. Trauma plays a part in shaping our personalities. Autism is Autism. 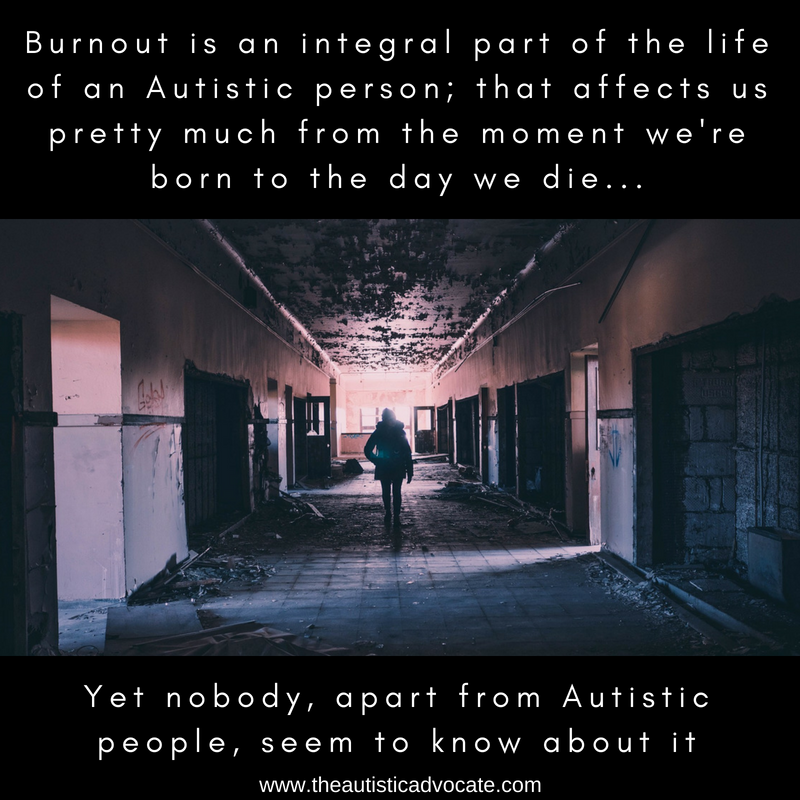 Autistic Burnout is real. It exists. And it plays a huge part in taking our lives. Repeated short term burnout is completely unsustainable and has huge long-term implications. So please, whatever you do, take care of yourself. "Autistic Burnout: The Cost of Coping and Passing"